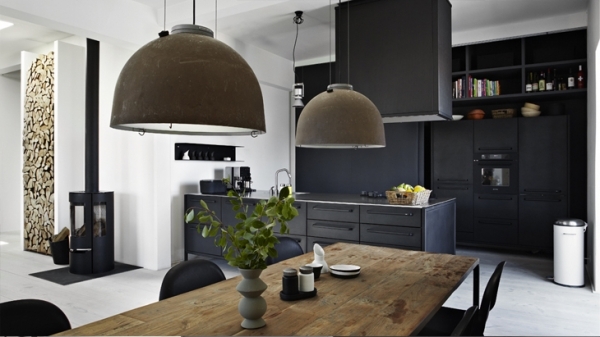 This gorgeous dark interior was created by Morten Bo Jensen, chief designer at Vipp. It is located in the abandoned pencil factory, and features an open plan, strong black and white contrast, and warm brown accents. The kitchen is absolutely gorgeous in this dark interior. 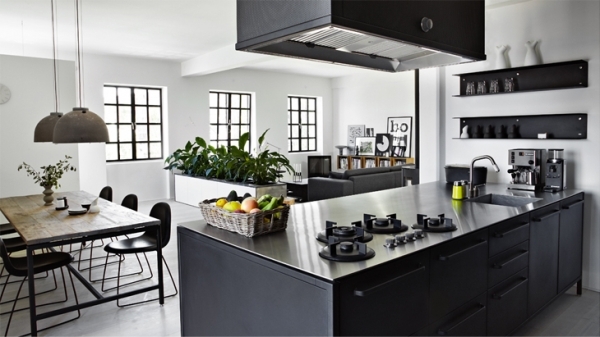 The open shelving and the cabinets are matte black. The countertops are also dark, and the hardwoods are ash color. 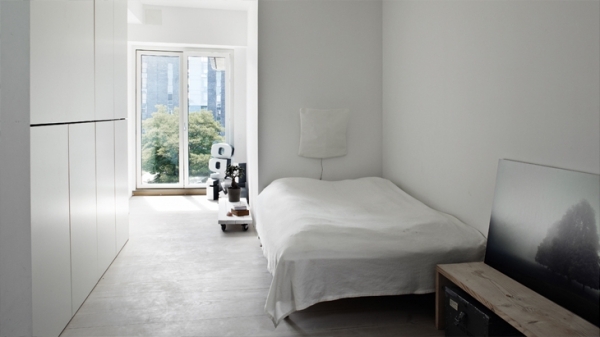 The bright white wall and waste basket provide opposition to the black, brightening the space. The beautiful browns in the dining room add warmth to the open plan, and the ash colored hardwoods continue in this room, effectively lightening this gorgeous area. Two fantastic brown lamps, hang from the ceiling, lighting the fabulous wooden table. Surrounding the table, black modern chairs complete the space. The living room in this dark interior is simple and clean-lined. 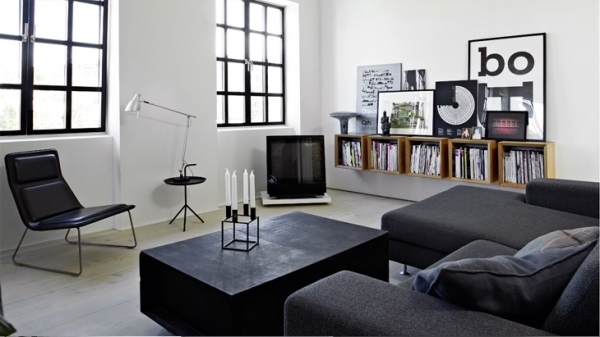 There is a black L-shaped sofa and a black square table. The windows are gorgeous, allowing natural light to pour in and brighten the space. The wall of logs adds warmth, interest, and a bit of earthiness to the room. On the wall, wooden open shelving provides storage, and creates a fantastic place for a multitude of artwork. 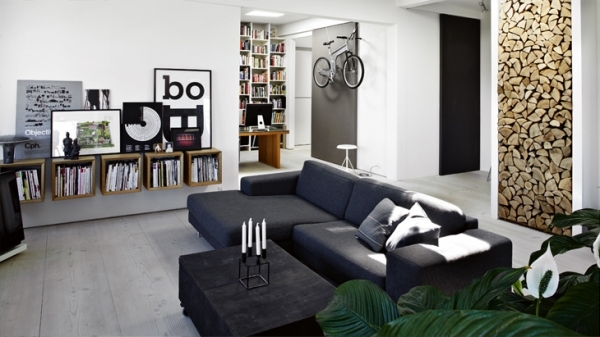 In the office space, lovely built in shelving furnishes a place for books, while a black accent wall continues the theme of the home. The wooden desk and hardwoods continue to warm and brighten the sensuous space. The bathroom is fantastically done. Dark gray tile, concrete walls, and a white bathtub are placed in the room. A piece of art and a plant are placed on a warm wooden bench, adding coziness and completing the space. 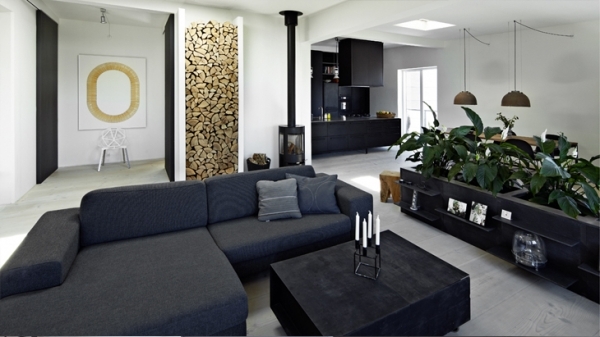 This dark interior is sleek and well put together. The black is brightened by the white, and warmed by the numerous wooden accents, fashioning an alluring and airy design.